General Motors may be the first U.S. automaker to build a car in China and sell it in the U.S. market. IHS Automotive says its analysis leads it to believe GM is planning to start shipping a small SUV, the Buick Envision, back to the U.S. by next year. The car is built in Shanghai for the China market. GM builds and sells more cars in China than in the U.S. The Buick brand is very popular in China, far more so than in the U.S.
GM would neither confirm nor deny plans to export the Envision to the U.S.
"It is all speculation at this point," said Buick spokesman Nick Richards. "To this point we haven't disclosed any plans for it outside of China." There is only one other major automaker, Volvo, which has announced plans to export a car from China to the United States. And Volvo is owned by the Chinese automaker Geely. GM (GM) could face a backlash if it decides to export a Chinese car to the U.S. The federal government spent $49.5 billion bailing out GM when it went through bankruptcy in 2009. GM repaid its loans, but taxpayers ended up with a $10.6 billion loss on the bailout. GM and other automakers' investment in plants in China and elsewhere in the world have been criticized by U.S. politicians, including leading Republican presidential candidate Donald Trump. And GM, along with Ford Motor (F) and Fiat Chrysler (FCAM), is in contract negotiations with the United Auto Workers union. The current pact is due to expire next month. A key union demand in those talks is guarantees from the automaker to build as many cars as possible for the U.S. market at U.S. plants. The Envision is a compact SUV, and Buick does not currently offer a small SUV for its U.S. buyers. IHS forecasts that GM would be selling about 38,000 Envisions in the U.S. by 2017, compared to about 126,000 it is now selling annually in China. "I think it's much more needing the product in the U.S. market than having excess capacity in China," said IHS analyst Stephanie Brinley. "It'll be a nice boost for Buick in a popular segment of the U.S. market." So far the growing demand for cars by Chinese buyers has swallowed up most of the output from auto plants there. But more auto plants are being added in China every year by car makers focused on the market and Chinese economic growth is slowing. So some critics of U.S.-China trade policy are concerned that China could soon take aim at capturing a significant share of the U.S. auto market, hurting output from U.S. plants. "It's not going to be viewed by buyers as a Chinese vehicle," she said. "The Buick Encore is imported from South Korea. 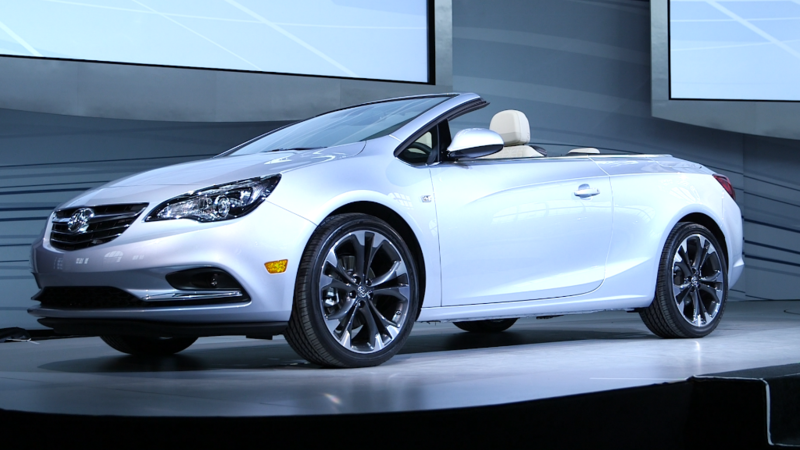 The Cascada will be coming from Europe. Most people don't even know where the cars come from. I don't think this means U.S. consumers will be more inclined to accept a Chinese automaker."